This white air-knit gamer by CCM was worn by Igor Larionov during the 1998 NHL All Star Game. 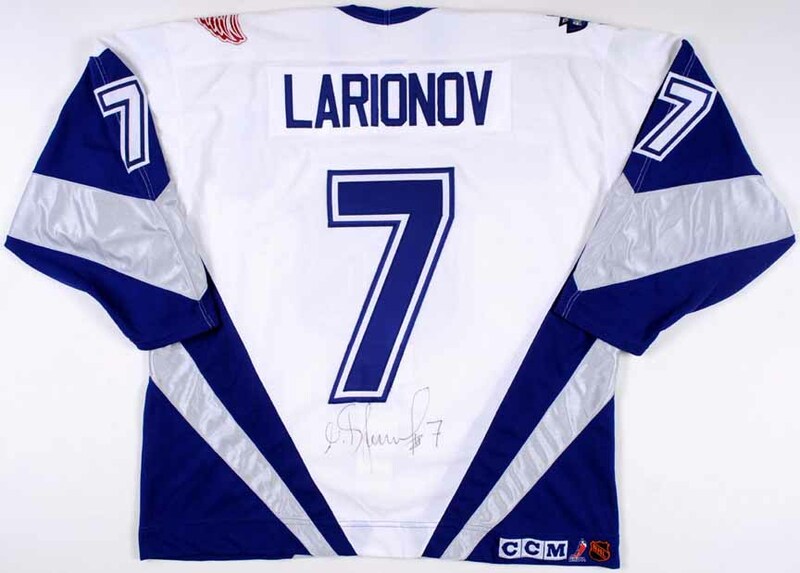 Larionov is considered one of the greatest Russian players in history. He began playing professionally for the Soviet Union at 17 years of age. Igor partook in his first of 3 Canada Cups in 1981. He would partake in 3 different Olympics, the World Cup of Hockey, Rendezvous ‘87, a couple of Super Series and numerous other international competitions. Igor owns 6 Gold Medals, was a 4-time 1st Team USSR All Star and was named the 1988 USSR Player of the Year. He will be best remembered for centering the legendary ‘KLM’ line that included wingers Sergei Makarov and Vladimir Krutov. After a dozen years in Russia, Larionov joined the NHL’s Vancouver Canucks who had the foresight to draft him in the 11th round of the 1985 NHL Entry Draft. Igor played for Vancouver for 3 seasons and then spent parts of 3 more in San Jose. In 1995-96, Larionov had the good fortune to join the Detroit Red Wings where he was teamed up with some of the finest Russian born players on the planet. Over the next 8 years, Larionov and the Red Wings won 3 Stanley Cups. Larionov retired following the 2003-04 season and was rightfully a first ballot induction into the Hockey Hall of Fame in 2008. Proudly sewn to the left breast of this gamer is the Captain’s “C”. Sewn to the right breast is his countries flag. 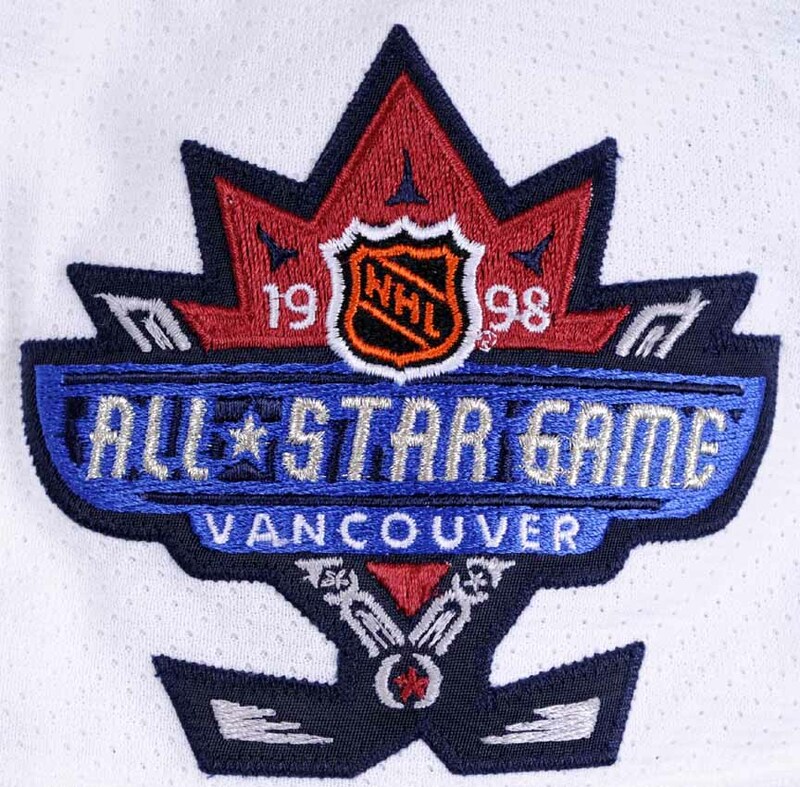 The left shoulder bears the Detroit Red Wings logo while the 1998 Vancouver All Star Game patch is sewn to the right shoulder. The game wear on this size 54 sweater is typical All Star Game light. On the back just beneath the player number is a beautiful black sharpie signature in Larionov’s own hand. Sewn to the inside fight strap is the official 1998 All Star game identifier. The 1998 NHL All Star Game featured a new format that pitted a North American born team against players born in the rest of the world. The game ended in an 8-7 score favoring North America. Larionov scored at 9:41 of the 3rd period to bring Team World to within one, but it turned out to be the game’s final goal. An outstanding example from the 1998 Vancouver All Star Game that sports the prestigious letter of honor and was worn by this legendary Hall of Famer during a Stanley Cup winning season.